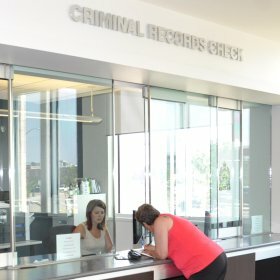 Please Note: the Criminal Record Checks Office will be closed on Friday, April 19th and Monday, April 22nd, due to the Easter weekend. Please note: online record checks may not be suitable for everyone. Please review the information carefully to determine if this is the right choice for you. Complete one of our Criminal Records Check application forms. Forms may be completed in our office or you can print one off online and complete it before attending our office. Our application form can be downloaded here: Criminal Record Check Application . You will require two pieces of Government issued ID - one of which must be a valid photo and both pieces of ID must be in the same last name. Volunteers will be required to submit a "volunteer letter" from the organization seeking your assistance. This letter must be on original letterhead and must have an original signature from the organization representative. E-mailed, faxed or photocopied letters will not be accepted. If you do not have the required letter from the organization then the normal application processing fees will apply. Processing time will vary from applicant to applicant based on the length of time and location of a previous residence. A police records check from another agency will inevitably increase the amount of time required to process your local criminal records check. Processing requests to other police agencies could delay the completion of your criminal records check for approximately 2 weeks. If you will be working or volunteering with Vulnerable Persons (i.e. children, seniors, or people with disabilities), the "Consent for Persons Applying for Positions within the Vulnerable Section" needs to be completed on our Criminal Record Check Application . The Vulnerable Sector search can only be run for employment or volunteer purposes within Canada. The Vulnerable Sector search cannot be run for applicants under the age of 18 years old. This search may require the submission of fingerprints to Ottawa. This search is based solely on the applicants' date of birth and gender. Please note that it is up to your employer or the agency you are volunteering with that determines if a vulnerable sector search is necessary. Please find out if you require the Vulnerable Sector before attending our office for your Criminal Record.